The Bussey-Saksida Touch Screens with full integration of optogenetic pattern stimulation. Free movement and natural behaviour is ensured using highly flexible 0.5NA fiber optic cable and commutator-mounted LED modules. The following flow diagram shows a system to stimulate two animals (in separate chambers) in two regions with two wavelengths (for example, Blue 465nm is optimal for activating channelrhodopsin(ChR) and Red 630nm for Halorhodopsin activation). Each Channel has individual patterns available in the software. A typical example of subtle pattern stimulation is as follows: START an opto-pattern with a touch screen response; PAUSE when back IR beam is broken; UN-PAUSE when animal enters the feeding trough; STOP when front IR beam is broken. Maximal output is set per channel. Minimal intrusion using 110/125 fiber stub in mice. 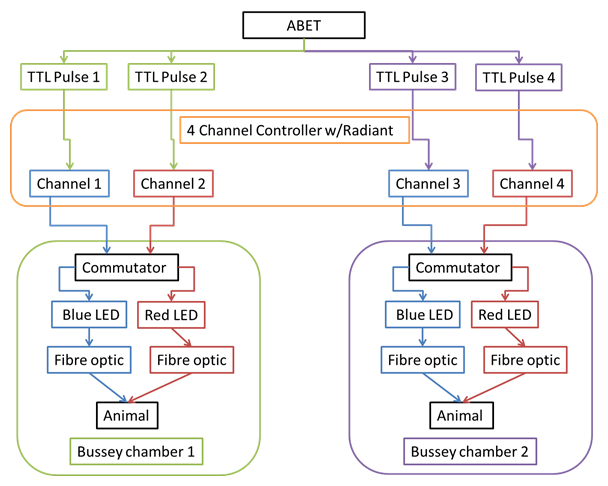 Light output figures in the table below are quoted at the fiber stub to verify what is being delivered to the tissue. Whereas light quoted at source can be unrepresentative due to losses at rotary joints and fibre connections. An approximate comparison with a 0.39NA cable as used in Laser systems: The Blue 465nm Module would give a maximum of approx. 8.1mW at the end of a 200/230µm 0.66NA fiber stub. This is not including any losses if a rotary joint was introduced (approx. 50% Based on a 3Db insertion loss). 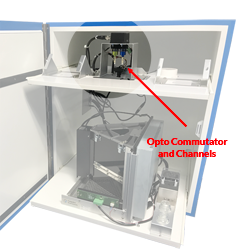 The PlexBright® Optogenetic Stimulation System provides an innovative, economical, turnkey approach to effectively perform acute, chronic or in vitro optogenetic stimulation. The PlexBright System is Plexon's fastest growing product line offering exceptionally high intensity LED Modules with the highest performance Optical Patch Cables in the industry. Plexon’s second generation, super-intensity PlexBright LED Modules provide outstanding light stability and pulse characteristics – all within a very small footprint. Our ever-expanding series of powerful, fiber-coupled PlexBright LED Modules effectively elicit responses from several opsins targeted in neuroresearch, including channelrhodopsins (ChRs), archaerhodopsins (Arch) and halorhodopsins (NpHR).